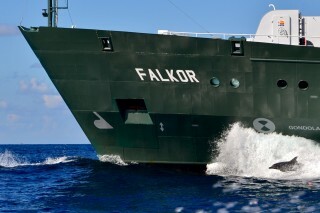 “Let’s give them a little challenge,” said chief mate Niklas Pfaff. Then he gunned the engine on Falkor’s jet boat, Atreyu, and we sped away from the ship. The challenge was for a pod of a dozen or so dolphins, and they were more than able to keep up. For the next twenty minutes even the most jaded veterans aboard were impressed by the show the dolphins put on. They jumped and spun at the bow of the ship, and all around our small boat, and looked like they were having a great time. The crew had launched the relatively new jet boat for a test run, so the dolphins were just a bonus. 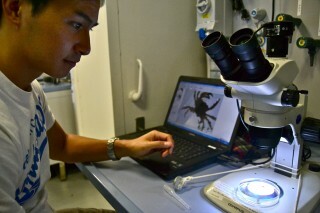 Jonathan Le examining a tiny crab under the microscope with a photo of the crab visible on the monitor. Once we got back on the ship, there was a mystery afoot. I kid you not, the team couldn’t find Mysterious Bank. It was as if the place had simply vanished. Some also held to the far-fetched notion that perhaps we simply had the wrong coordinates. But we did eventually find it. Mysterious is larger than anyone realized and should offer plenty of interesting sights once we dive there in a few days. Our next ROV destination, though, is Dream Bank. The mapping there revealed some interesting bumps to the east, but Wes Tunnell assures us it’s more likely these bumps are the remains of decommissioned oilrigs than shipwrecks. So, we’re halfway through the trip with nary a gold coin to show and no prospects for finding any. But we’re gathering plenty of other types of samples including crustaceans, soft corals, and sea stars, most of which the team freezes for later studies after determining species. 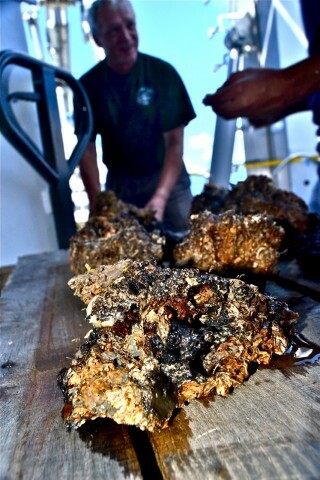 The ROV pilots have also grabbed a few rocks for Andre Droxler. 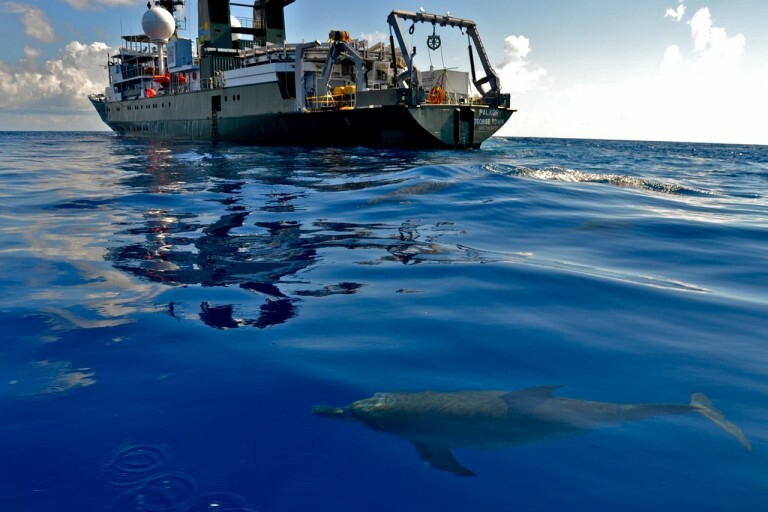 Droxler’s goal is to find rocks that are small enough to pick up with the ROV and have remained relatively unaltered since the ice age days when they were part of shallow coral reefs. That was around 12,000 years ago, so this is a pretty tall order. The main problem is that the worms and such that bore into rocks leave behind material that can throw off dating techniques. Andre Droxler and Pankaj Khanna broke open a large rock sample to look for pieces suitable for carbon dating. Yesterday the team grabbed a rock about the size of a bowling ball, mainly because they knew it would hold lots of animals and that would be an easy way to collect them. But Droxler and Pankaj Khanna decided to see if any of the material was pristine enough for dating. So, they smashed the rock open on the back deck and did indeed find some promising bits and pieces. We ended the day with a barbecue on Falkor’s upper deck. 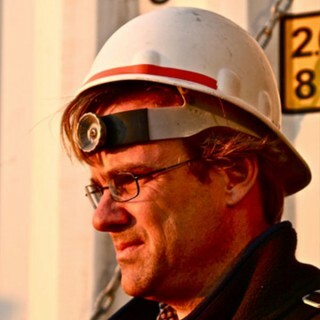 It was a nice break, and a good way to mark the successful completion of the first half of the expedition. And, just as the sun was setting, the dolphins dropped back by to put on another show.